The American film, which had been created in 1935 and named after the popular song, tells about the deed of Charles Wells, a popular roulette gambler of the 19th century who was able to broke the bank at Monte Carlo casino several times and win much money. As opposed to Joseph Jagger who used the principle of biased roulette wheel to win money, Mr. Wells affirmed that it was just luck that helped him to become such a successful roulette player. He was described in the song, book and movie, described below, as being the most popular and successful roulette player ever. This is a romantic company which could seem to be a little bit boring for modern audience because of some historical aspects of those times (1935), but those historical events take second place there. 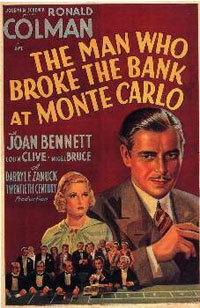 Actors play their roles perfectly: Ronald Colman is an elegant and romantic man; Joan Bennett is fantastic though her role is a little bit clichéd - so, the audience will not be disappointed after watching this old but fashioned black-and-white film about the world of gambling. The events of The Man Who Broke the Bank at Monte Carlo take place after the World War I: Russian prince decides to visit Monte Carlo and play roulette after he had been given some money by Parisian Russians. He is very lucky and he breaks the bank several times but the casino does not want to let him go with all that money: they ask him to continue his playing to honor the tradition.